It's the last day of the month and also National Science Day 2019. We are super happy to invite both you and your colleagues to our after work get-together arranged with cocktail experts Bar7. 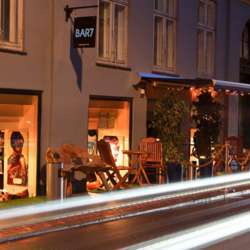 Bar7 is one of Denmark's most stylish bars and offers drinks & cocktails in a choice of rooms with comfy designer sofas & funky decor. Expect to have a fun, cozy evening meeting like-minded professionals listening to the cool sounds of jazz /soul classics as background music, and enjoying Bar 7's tasty snacks & scientific cocktails. Some of us will be discussing the way science and new technologies are evolving in Denmark and the rest of the world. With the help of science, humans have made their lives better and easier. Not only this, we have made impossible things possible like man is reaching into space, robots, computers etc. Welcome desk closes at 22:00 and please remember to bring your business cards.